Built for power, speed, control, and ease, this 1000-watt appliance flattens and bakes 10-inch tortilla wraps, pitas, chapati, roti, and other flatbreads. Key to its performance are heavyweight die-cast aluminum top and bottom cooking plates that quickly and uniformly distribute heat so there are no hot spots to scorch breads. The plates are coated with nonstick material for easy release and simple wipe-clean convenience. An automatic temperature control takes the guesswork out of cooking, and a light signals when the flatbread maker has been heated to the proper temperature. A cord wrap reduces clutter, and the appliance can stand on end for storage!. 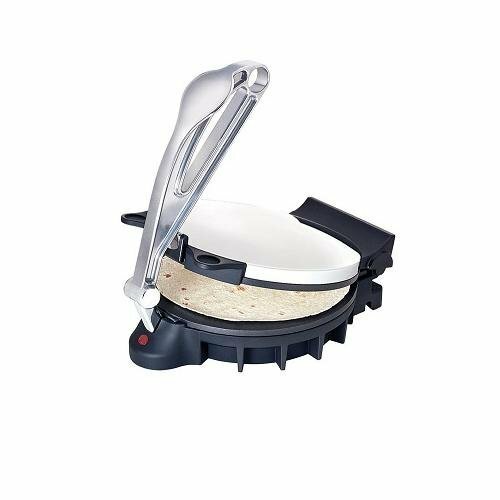 View More In Quesadilla & Tortilla Makers.